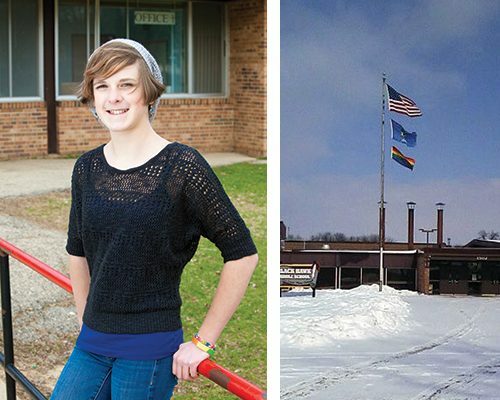 Nicole Campbell got involved in her middle school GSA to support people like her aunts and to help build a more inclusive future for all her peers. I grew up thinking it was the most normal thing in the world. I thought everyone had gay family members. I remember being really surprised when I learned that Aunt Rose and Aunt Becca weren’t married. It never occurred to me that it was possible that people who loved each other as much as they did wouldn’t be married. It only came to light when I was older that it wasn’t because they didn’t want to, but because they couldn’t. I didn’t understand it fully, and a part of me is still bewildered at the thought. That’s when I knew something had to be done. Of course, in fourth grade, I didn’t have any clue what I could do to help. Lucky for me, my older brother was there to teach me. He told me about the Gay-Straight Alliance (GSA). Two years later I joined the Black Hawk Middle School GSA. The organization was started in the 2010–2011 school year by students with the help of social worker Sherie Hohs and Spanish teacher Matthew Mulligan. In just three years, our little community has grown from only 10 members to over 30. Thanks to our incredibly diverse, rainbow-spectrum mob, we are able to take part in and organize a number of school-wide, small group, and even inter-community events. For example, one event that we are currently planning for is the annual Day of Silence. Day of Silence is a nationwide event during which participants wear a rainbow ribbon if they are choosing to remain silent all day, or a purple ribbon if they support the cause but opt to speak, in order to raise awareness for the people in our community who feel like they have to stay silent about who they are. We also hold Ally Week and No Name Calling Weeks to educate students on the issue of bullying, including within the LGBTQ+ community. Among other things, we frequently hold assemblies, including multimedia presentations featuring information on upcoming GSA events. Just within our GSA, we work to raise awareness among members and to plan various occasions, not to mention doing our best to support everyone in our GSA. For instance, we thought that it would be really cool to fly the rainbow pride flag during No Name Calling Weeks. Thanks to the cooperation of our school principal, Sean Storch, we were able to do just that. I feel truly lucky to be a part of such a welcoming school environment. Weekly meetings often consist of sharing LGBTQ+ and personal news, problems and solutions within our school, and thinking ahead. I try to always find at least one thing to share regarding news from around the world, nation, state, or even just within the school. When I come to GSA, I really feel at home. It feels like a truly safe place where I can be myself: nothing more, nothing less. From the outside looking in, we seem like just a crazy bunch of teenagers, ranting about problems. But we’re more than just that; we are a family that fights for what we believe. Thanks to By Youth For Youth (BYFY), our GSA recently received a grant that we plan to use in many ways, the first of which is simple: supplies. We advertise the GSA with posters all over the school, and this grant will help us get more poster paper, markers, tape, etc. The second use deals with the education piece of what we do. We plan to buy books for “classroom libraries” in order to make teaching lessons involving LGBTQ+ material easier. It will also give students the opportunity to self-educate on the same topics. The third way we plan to make use of the money is through what we hope will be a lasting reminder of acceptance, a welcoming environment, and safety throughout our school. We would like to commission an artist (or a couple) to make a mural involving diversity, community, and all the colors of the rainbow. Finally, we want to make sure there are enough resources to continue running the GSA for years to come. We feel that keeping GSA alive is the most important part, so that everyone, regardless of race, gender identity, sexual orientation, or any other factor can be part of a welcoming and safe community. Beyond that, it will have to be up to future leaders to decide.